Looking for true happiness in Santa Barbara…you’ll find it in a tiny Chihuahua named Fox! Fox came to DAWG with her daughter, Chiquita. They lost their home when their family moved. Chiquita found her new forever family, but Fox is still anxiously awaiting hers! Shy at first, Fox warms up quickly. She is the perfect size to snuggle with or go on beach trips! She’s a real sweetheart in more ways than one. Meet Fox at DAWG (Dedicated Animal Welfare Group), located at 5480 Overpass Road in Goleta, CA or visit online at www.sbdawg.org. Adopt her and you’ll realize the true meaning of happiness. Looking for true happiness in Santa Barbara…you’ll find it in a tiny Chihuahua named Austin! 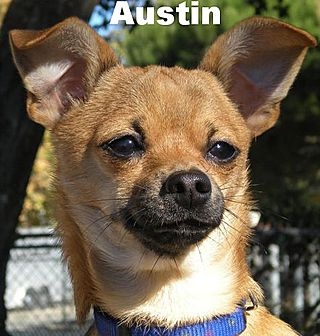 Austin is a tiny, sweet, and good natured little fellow. I guess you could say he’s cute as a button! He loves to play with his kennel mates, but he is also looking for the perfect parents to take him home! You can’t go wrong with this little guy. He’s a real sweetheart in more ways than one. Pets…growing segment of real estate industry! Santa Barbara is a very pet friendly community! Pets and their families are a growing segment of the real estate industry and we at Santa Barbara Connection can help you find the best pet friendly real estate available in all of our beautiful locations, including Montecito, Hope Ranch, Goleta, Carpinteria, and …Santa Ynez (home to many world famous horse farms). Meet our friendly little Chihuahua mascot, ChaCha. ChaCha was born into a Santa Barbara family of Real Estate Professionals. ChaCha’s mother, Sylvia Miller is one of Santa Barbara’s most experienced real estate agents. ChaCha’s grandmother, the late Gail Miller Ross, was considered amongst her peers to have been one of the best Realtors® in Santa Barbara.